Discussion in 'Draft Games Forum' started by Physiocrat, Aug 30, 2018. A balanced and complimentary 3-5-2 designed to get the best out of Diego Maradona. In offence the front three are provided the perfect platform to win the match, with an all-star German midfield filled with leadership/workrate and a world-class defence capable of keeping a clean sheet against any attack. In possession Maradona provides the focal point, equally capable of running through the opposition or releasing the Brazil '94 two-punch of Bebeto/Romário or an overlapping Cafu/Marcelo with his exquisite passing range. Maradona boasts the highest peak of any player and elevates the performances of those around him – given the calibre of his supporting cast and wealth of passing options upfront, he should be too hot to handle. DEVASTATING AND RUTHLESS ATTACK – The attacking trio is complimentary and built to get the best out of our star man. Romário is the ultimate #9 reference point for Maradona to find in the box. He scored 133 goals in 155 games at his peak and boasts arguably the most devastating combination of acceleration, movement and finishing ability across any footballing era. At international level he formed a beautiful World Cup winning partnership with Bebeto who complemented him in almost every way. Bebeto will work the channels and link up play as the deeper second striker, whilst also packing plenty of punch himself, as shown in his 39 goals in 75 international games for the Brazilian national side. MIDFIELD PLATFORM FOR MARADONA – The midfield has been elevated significantly with the introduction of Breitner, whilst retaining the same focus on industry, physicality and aggression to stamp authority across the middle of the park. In Schweinsteiger we have the most complete midfielder of the last decade – the midfield lynchpin who led Bayern to a historic treble and Germany to the ’14 World Cup (with a MOTM virtuoso performance shackling Messi in the final). In addition to his warrior-like mentality and ball-winning ability, Breitner brings a whole new level of technical quality in possession and his passing range is perfect for picking out that pacy front line. As a 1-in-2 goalscorer in his pomp Breitner provides a different type of threat breaking from the heart of midfield, firing in 28 goals in the 81/82 season alone. PROVEN BACK LINE – The defensive set up is completely natural and complimentary, with each player suiting their individual role in this system. On the flanks arguably the two greatest attacking fullbacks of all time flank a Juve-inspired back three reinforced with the greatest of them all - Gaetano Scirea. In a 3-5-2 set up I don't think there is a better defender in the history of the game (I'd take Scirea over Baresi in a 3-5-2) and likewise at wingback both Cafu / Marcelo are arguably the most devastating pairing possible in terms of offensive impact. As a souped-up version of Bonnuci, Scirea elevates a defence that was already the most effective in modern times - conceding an average of 0.59 goals per game over six years, the best record of any defence at any time from any of the big three European leagues (Serie A, La Liga and the Premiership). The team built around Pelé has to resemble his Brazil/Santos sides, which is why I went with 4-4-2 — it brings the best of him and he can showcase both his goalscoring and creative sides to full extent. The defensive line is fairly deep, and, although I don't plan on conceding possession here, my team will be pretty direct — closer to late 50's Brazil that to that vintage 1970 side. In Suárez (La Grande Inter), Figo, Rensenbrink (totaalvoetbal) and Law (who based his game on Di Stefano*) I have players who combined breathtaking attacking skill with exemplary work rate, which is crucial for this system — only Pelé is freed from all defensive responsibility. What separates my team from the opponent is the amount of different routes to goal, creative sources and goalscorers. The biggest mismatch in the game is my attacking 4 against Theon's defence. Marcelo's attacking prowess secured him a place in history, but his defensive game is a liability — I'd say that even Carlos, who is often criticised for being unbalanced, was a significantly better defender. Figo will have a field day on the right — same as the Pelé - Law duo against that Juventus back 3. In my opinion, neither Chiellini nor Barzagli are good enough to help out Scirea in this enormous task (especially with the former covering for Marcelo on the left). 2 of the opposition's most dangerous players, on the other hand, are facing fierce competition — Bobby Moore is one of the best possible fits for Romario** and in Desailly I have one of the GOAT defensive midfielders to chase after Maradona. With 2 midgets (Romario - 1,67m; Maradona - 1,65m) and probably Caniggia (1,75m) starting up front those magnificent wingbacks will be limited to crossing low — no point in trying to outjump Vidić and Moore — or to cut inside, which makes it easier to defend against. Batigol will be surely missed. Pelé — Was Pelé the most complete attacker of all time? Denis Law — Classic Players - Denis Law: The greatest forward in United's history? I thought Theon may have gone 352 to really soak up harms' attack. Breitner, Mascherano and Bastian in midfield with Maradona behind Romario. Absolutely delighted to get a Bebeto / Romario front two in one of these. Without a doubt one of the most devastating and complimentary partnerships that I've ever seen, and quite possibly my favourite given the abundance of pace and technical quality. Also fits perfectly with the theme of the draft, around maximising the performance of GOATs with complimentary supporting casts. Nah, it was an option of course but didn't see the need given that all-conquering German partnership and then the Italian back line marshalled by Scirea. I'm a huge fan of Masch and I'd have happily played him in a final (don't think he's ill suited at all) but for this game and with these teammates I don't think he was needed. Breitner and Schweinsteiger have the ball winning under control and Scirea is well placed to marshal that area when required. As reference point if we look at Harm's backline it has less protection even without Mascherano. As a collective partnership Suarez / Desailly (the purest DM of the bunch) offer less defensively that Breitner / Schwein, and then he's obviously playing with two centre backs whereas we have three. I think we're clearly more solid down the core as it is, so Masch wasn't really needed. 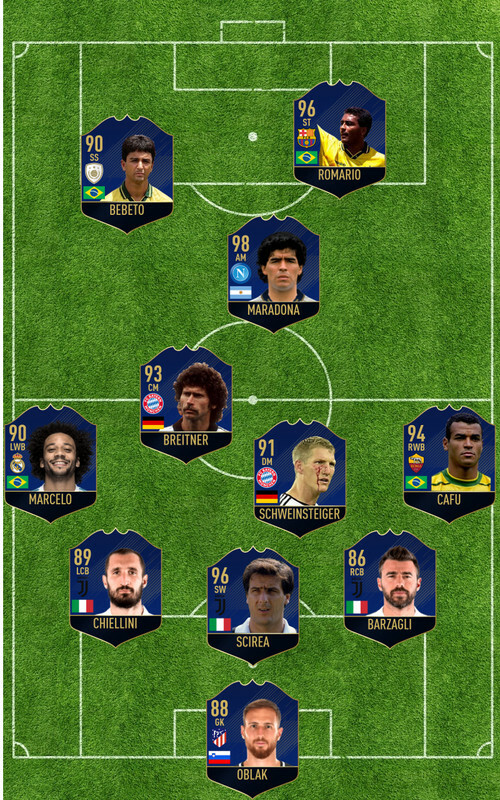 Plus when you have Bebeto and draft Romario there's only one thing to do in terms of line up. As soon as Desailly was picked, I thought harms had won the final even before it started, amazing side that. But there is just 1 problem with his side. 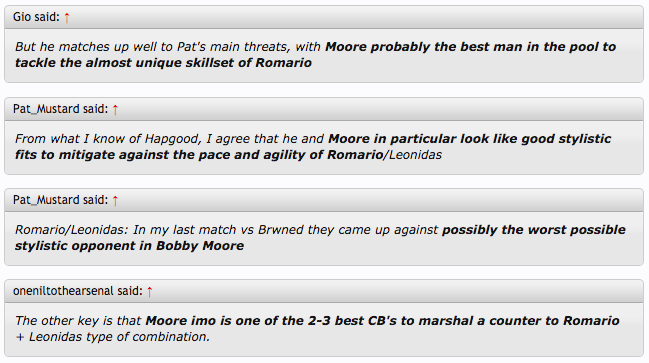 Both Moore and Vidic were a bit suspect to super fast players. And of course they face Romario. Yours certainly has more dynamism than harms but Suarez has more defensive nous than he is generally given credit for. Going 352 is not what I'd go for here but just thought you may do it given harms' front four and the rating of Chiellini and Barzagali. That makes sense. I forgot you had Bebeto. Going 352 is not what I'd go for here but just thought you may do it given harms' front four and the rating of Chiellini and Barzagali. Just to nip that in the bud as I've argued previously I don't buy the criticisms of Chiellini / Barzagli given what they've accomplished at domestic, Continental and International level. They're playing in their perfect positions and with perfect defensive partners (one actual real life partner and then one souped-up version of the real thing in Scirea, who retains the Italian, Juventus and 3-5-2 connection). When it comes to tactics and set up its a defence which maximises their impact and influence. Secondly, even if you don't agree with me on how I highly they should be rated (I maintain that the Juve trio will be seen as one of the best of the last 20 years once they've retired - Scirea obviously is one of the greatest of all time) I'm not sure how it's a factor in this match when harms is boasting a back four with Evra, Vidic and Phil Neal in the backline. I'd argue quite firmly that not only are Chiellini / Barzagli at least as good ability wise, but they're playing in a system and with teammates who compliment their performance in a way that the opposition defence doesn't and this familiarity and tactical cohesiveness elevates their performance even further. Delighted to get the chance to pair Breitner and Schweinsteiger here. For me they are both shoe-ins for an all-time German XI and would form a hugely complementary partnership - defensively rock solid, commanding on the ball, decisive going forward. Both absolutely proven at all levels having won Champions Leagues and World Cups with a track record for standing out in the major finals (Schweinsteiger MOTM in 2014, Breitner one of only four players to have scored in two WC Finals). It's a bit harsh on Sammer, but Schweinsteiger is the better fit with Beckenbauer, Matthäus and Breitner in the team and you can't really argue against his influence in reaching 3 CL finals and winning the treble and the World Cup. He'll also soon be the player with the most league title wins for Bayern. I'd probably kick Breitner out of the team before Schweinsteiger, if you want to make room for Sammer, but it's really difficult to find a sensible XI with Beckenbauer and Sammer together in it. Serious goal threat like that needs a dedicated defensive midfielder to try and limit it. Desailly cannot be in 2 or 3 places at once and I cannot see Harms midfield unit offering much resistance off the ball. Especially now that Lerby's dynamism and doggedness and Beckham's engine have been jettisoned for more attack-minded alternatives. In the 1979-80 season, Breitner was inspirational and would strike up a famous partnership with Karl-Heinz Rummenigge as Bayern reclaimed the Bundesliga title for the first time since 1974. They won the title again the following season, and his influence at the club was growing ever stronger. After he and Rummenigge were sent off in a 1981 Trofeo Santiago Bernabeu game against Real Madrid, Breitner was apparently responsible for the team's decision to abandon the game. "The coach, Csernai, wanted to keep playing," El Mundo Deportivo reported, "but it became clear to everyone who is charge of the team: Paul Breitner." It should be noted that his influence was not without merit: he was named the country's player of the year in 1981, as well as finishing runner-up to Rummenigge for the Ballon d'Or. @Gio Bayern lost the European Cup final in 1982, don't know how he could have scored the winner there Great presentation of Breitner's goal threat, 28 goals in a single season is outrageous. Don't even remember any other B2B midfielder ever scoring that many. Also Theon deserves plaudits for the team sheet, looks really good. Nice catch with the European Cup final. And always happy to take the plaudits but that team sheet was all @Gio (inspired by @Enigma_87 ). I'm terrible on computers so something like that would be a nightmare for me - can barely upload an image! Agree it looks amazing, better than I thought it would. I really like the National flags, visually it shows the partnerships through the team in an effective way, with the all Italian defence, German midfield, Brazilian wingbacks and Brazilian front two. Then Diego. During the late 1980s and early 1990s, Brazil struck gold with one of football’s greatest ever striker partnerships – Romário and Bebeto. The two scored 94 goals in 145 caps for the Seleção, and struck fear in defenders around the globe. While Romário is recognized and celebrated as a transcendent player, Bebeto was a world class striker in his own right, and his talents helped power the success of the Brazilian National Team through the 1980s and 1990s. Born in 1964 in Salvador, Bebeto started his career with local club and youth system powerhouse Vitória. His skill on the ball and eye for goal caught the admiration of managers throughout Brazil. While he was a gifted passer and playmaker, he was even better at scoring. Teammates and competitors alike commented on the ease with which he found the back of the net – time after time scoring difficult volleys with the same simplicity and grace as an unassuming tap in. Bebeto made his debut for the Seleção in 1985, but it wasn’t until 1989 that he really broke through for the national team. Bebeto led the front lines for a Brazilian team that dominated the 1989 Copa America tournament. Brazil lifted the trophy with Bebeto as the tournament’s top scorer, netting six goals. With Romário tied joint-4th with 3 goals, Brazil foreshadowed the attacking dominance the two would showcase to the world in the 1994 World Cup. After finishing as the top scorer in the Brazilian league in 1992, Bebeto completed a transfer to Spain where he joined Deportivo La Coruña. With Bebeto leading the line, Deportivo finished 3rd, 2nd, 2nd in successive seasons, and their overall success included winning the Copa del Rey, the Supercopa de España, and falling one goal short of winning La Liga in 1994. Bebeto became the face of the “Súper Dépor” era, and by the time he left in 1996, he had scored 86 goals in 131 appearances. These two were a little bit special, weren’t they? When Romario graced the pitch with Bebeto it was all about the Samba style. Brazil claimed a fourth World Cup in 1994 and it was largely down to these two. Playing at his peak, the small yet sturdy striker was a handful for all defences as he linked up superbly with strike partner Bebeto. His pace and tricky footwork baffled many a defender and resulted in him finishing with five goals and a winner's medal. When Bebeto put Brazil 2-0 up against Netherlands in the 1994 World Cup quarter-finals, he made for the sideline and began rocking an imaginary baby in celebration of his two-day-old son, Matthaus, named after Germany's Lothar. Joining Bebeto was Romario, generally known for rocking the boat rather than the cradle. The celebration has proved to become one of the legendary images in football history. However, for people with in-depth knowledge of the atmosphere in the Brazilian camp, this was indeed a very strange scenario. For years, Lethal Weapon I and II - as they were dubbed in the American media - had been at odds, forcing their coach, Carlos Alberto Parreira, to become a true diplomat and lay down a truce between the two hot-headed matadors for the good of the Brazilian side as they headed into the World Cup. Part of the background for their fierce rivalry ahead of the tournament was related to their battle in conquering the Spanish Primera Liga. At the top of his game, Bebeto finished on top of the Spanish goal-scoring table in 1992-93 with an amazing 29 goals for Deportivo La Coruna. This impressive feat was soon forgotten, when Romario stole the headlines with no less than 30 goals for Barcelona. While the rivalry between Romario and Bebeto was intense before the tournament, their mutual drive for success was ultimately to turn the duo into best friends. Brazil had not won the World Cup for 24 years and Parreira had succeeded in instilling a burning desire to return to Brazil with the trophy. United in their cause, Romario and Bebeto put their personal differences aside as they sought to conquer the world stage. As a partnership, although enjoying the same hunger for goals, they were different in build, personality and style. Romario was often criticised for being completely anonymous on the field only to then use all his powers of deception to produce a goal. Bebeto, on the other hand, was quick, nimble, elegant and superb at bending free kicks around a defensive wall - a roamer capable of playing in midfield as well as attack. During the course of the tournament Brazil found the net ten times on their way to their ultimate triumph with Romario and Bebeto sharing eight goals between them, reserving their place in the history books as one of the deadliest attacking duos ever. We had a really good understanding.The moves came off naturally, I always seemed to know where he was on the pitch and he also always knew where to find me. It was perfect. He finishes like nobody else. He's got velocity in short spaces: People think he's hanging around, stopped, then, bang, it's a goal. Bebeto and Romario weren't bad... Was arround that time I got into football. Absolutely these 2. Proper livewires. A few gifs below of the two in action together for Brazil. You could make a collection of these but gives a flavour of how they interact with each other and it showcases the technical similarities they had as players. In the third image it's not hard to imagine Breitner or Scirea floating a ball like that in behind Phil Neal for the two Brazilians to scamper away towards goal. And in the first image, I see that interplay being too hot to handle in the middle of the park, with Desailly already having his hands full trying to get to grips with Diego. Harms defense has been rubbish all tournament. To be fair, a central threat against 2 quick direct strikers is not the same as with a WF and No.10/SS. Anyways, went with Harms in the end because a 3-5-2 is always a suspect against a really well build 4-4-2/4-2-3-1 and when you have Pele in it, becomes all the more difficult. Also, Barzagli and Bebeto dont belong in a final for me. Maybe the likes of Evra and Neal don't too but who are they facing really? I know there is a lot of love for Marcelo in a 5 man defense but when he comes up against a peak Figo his attacking prowess is going to be somewhat limited. Completely disagree there is any tactical advantage in a 4-4-2 over a 3-5-2, literally never heard that before. The whole logic of the three man back line was to counter two striker systems like harms is playing. Also don't think its built or in anyway set up to stop Diego - frankly a midfield two (with one of them Suarez) against Maradona / Breitner / Schweinsteiger is asking for trouble. As far the last part, Barzagli has achieved as much as Vidic has but happy to let that one pass. The Bebeto comment is way off though and comes across as dismissive, he's the 6th highest ever goalscorer for Brazil, playing in a real-life partnership which has a proven history of being complimentary and devastating. He maximises the impact of Romario and dovetails well with Diego whilst ceding authority to the Argentine completely. There's more to fielding a good team than just picking the biggest names. Not really. Just went with the same formation as Lerby started on the left. The whole logic of the three man back line was to counter two striker systems like harms is playing. Two striker systems like diamonds. Against great wingers, a 3-5-2 is suspect to being over run defensively when the wing backs push forward or suspect to being limited offensively if the team is conservative. Its the same discussion that has been discussed to death. You cant have a defender and attacker at the same time. I would have probably agreed with you fully if Harms struck with Lerby-Suarez which is what lost him my vote in the semis. Desailly Suarez is pretty complimentary for me. Of course, sometimes nothing is good enough against Maradona. I do agree partially with you though because Suarez definitely is not a defensive monster despite his work rate. But then, I am fine that he struck with him because this is how a Pele side should look. A more hard working Gerson in Suarez and a better defensive cover than Clodoaldo in Desailly. You cant better that with anyone in history. The Bebeto comment is way off though and comes across as dismissive, he's the 6th highest ever goalscorer for Brazil, playing in a real-life partnership which has a proven history of being complimentary and devastating. Maybe you are right that I shud'nt be fully dismissive. But I still dont rate him good enough to be in a final. In an all time draft, which round do you think Bebeto would go in? I dont think in the first 11 rounds. For example, below are the squads in an all time international peak draft. He doesnt feature in any squad. In fact, looks like you were playing too and you chose a pre footage Leonidas in Round 12 ahead of Bebeto. I don't call him not suitable here or a overrated player in general but he doesnt belong in a final. I'll shut up if you can find one voter to say otherwise. As far the last part, Barzagli has achieved as much as Vidic has but happy to let that one pass. I'm still not sure on how you're dealing with Pelé; Scirea is not the best stylistic fit for him — Pelé is stronger and faster, and your weakest players, Chiellini and Barzagli, are directly facing my devastating attacking unit. It's by far the biggest mismatch on the pitch. My weakest players, on the other hand (with 10 European Cup/Champions league finals between them), aren't even facing any wingers. Do you have examples of Moore struggling against pacey players? I'm genuinely interested. A one-man flank for Real Madrid who has won the Champions League four times. Frequently when Real have been unable to make the difference elsewhere on the park, he has stepped up to the plate and delivered the goods. He has that rare combination of the legs to boss an entire side of the pitch and the technical ability of your very best 10s. At this stage in his career it's not a stretch to consider Marcelo in a league of his own offensively as the most effective attacking fullback of all time. Marcelo possesses better technical ability than me. The rule is: if you cannot get back, you must not go forward. The current best specialist is Marcelo, who gets it right in both areas. He is a great attacker and a defender, a specialist of both areas. Typical business end of the Champions League performance below. 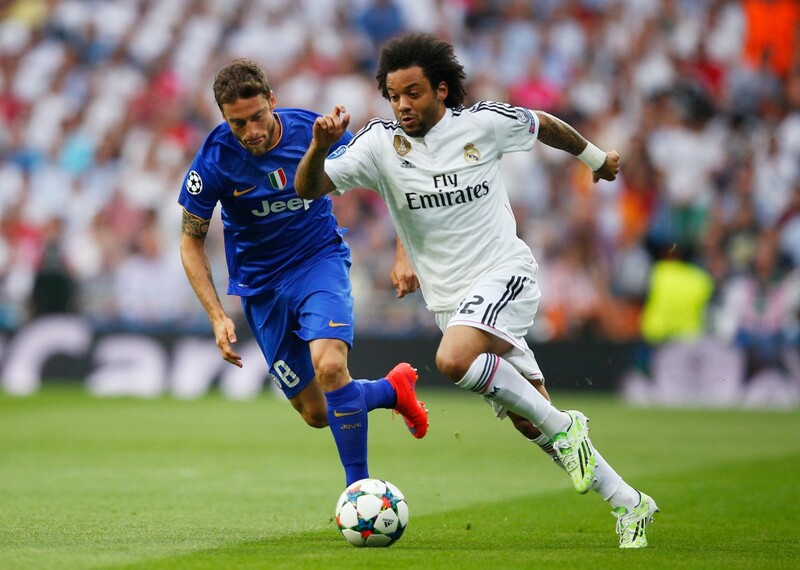 Facing up against a strong Bayern right flank, Marcelo controlled the game. His incisive quality on the ball and incisive dribbling cut the Bayern defence open on a number of occasions (1.50, 2.15). Look at his seminal defence-shredder to assist Ronaldo at 3.19. Not only that, there is fantastic defensive covering to prevent goals on three occasions (0.38, 1.36, 2.21). We have deployed Marcelo as a left wing back to maximise his flank-dominating qualities. He has proven himself at the highest level of the club game as a left-back for Real Madrid (often in a diamond), but we want to give him more attacking responsibility to stretch the play and give us another weapon to control the game and create chances. It's similar to how Scolari unleashed Carlos and Cafu by moving to a 3-5-2 in 2002 and was rewarded with two wing backs tearing it up at the top of their game - supported by the extra defensive cover provided by a back three. Up against Phil Neal he's a huge offensive threat in this match and there's no one better than Diego Maradona to pick out those surging runs. Maybe you are right that I shud'nt be fully dismissive. But I still dont rate him good enough to be in a final. In an all time draft, which round do you think Bebeto would go in? I dont think in the first 11 rounds. For example, below are the squads in an all time international peak draft. He doesnt feature in any squad. In fact, looks like you were playing too and you chose a pre footage Leonidas in Round 12 ahead of Bebeto. On the first part sorry but I can't agree with your tactical analysis at all. It's widely accepted that the reason for 3-5-2 was to counter two striker systems such as the 4-4-2 as it gives an extra man at the back i.e. the libero. Also at both International and Continental Level the 3-5-2 has been more successful historically than a 4-4-2, so I find it hard to believe it has some sort of tactical weakness. Just in the modern World Cup era you have Italy 1982, Argentina 1986, Germany 1990 and Brazil 2002 all winning the World Cup playing 3-5-2s. If we expand it to the European Championships you have teams like Sammer's Germany in '96, or Platini's Juve in the European Cup. 2. A four man backline with Vidic, Evra and Phil Neal. For all the mud that's being slung at Barzagli he's for better protected than those three (particularly as he's also in a set up which tactically plays to his strengths). As for Bebeto, if I'd picked Romario you can be damn sure I'd have taken him for the first few rounds. Thing to remember though is that was a different draft and it was unrestricted in terms of GOATs, whereas this isn't. To be honest I'm fine with you disagreeing, not much point saying anything more than I've already posted in the thread. From my perspective Romario / Bebeto were one of the best striking partnerships that I've ever seen. According to Geoff Hurst's autobiography, England full back George Cohen overheard Ramsey talking to his coaching staff about the possibility of dropping Moore for the final (1966) and deploying the more battle-hardened Norman Hunter in his place. However, eventually they settled on keeping the captain in the team. Moore had not been playing badly, nor had he given the impression that he had been distracted by his contract dispute prior to the competition. The only explanation was that the Germans had some rather fast attacking players, which could expose Moore's own lack of pace, and that Hunter – who was of a similar age to Moore but only had four caps – was the club partner of Moore's co-defender with England, Jack Charlton. But then again, I'd say that it's not a stretch to say that he is the weakest defender of that top-tier group (I'd rate both Carlos and Alves — two of the most questionable ones — as a significantly better defenders). And he is up against Luis Figo of all people — and if Chiellini moves to cover, it lefts Scirea + Barzagli against Pelé and Law! Also at both International and Continental Level the 3-5-2 has been more successful historically than a 4-4-2, so I find it hard to believe it has some sort of tactical weakness. Just in the modern World Cup era you have Italy 1982, Argentina 1986, Germany 1990 and Brazil 2002 all winning the World Cup playing 3-5-2s. Italy 1982 was 5-2-3 vs 5-2-3 in final. The best teams in the final were facing similar systems. And 4-2-3-1 was not as popular back then as it is now. As far as I can tell, its the 4-4-2/4-2-3-1 that eventually kicked out the 3-5-2 till the Italians brought the 3-4-3 back. But then again, I'd say that it's not a stretch to say that he is the weakest defender of that top-tier group (I'd rate both Carlos and Alves — two of the most questionable ones — as a significantly better defenders). I'd agree you have a point if we'd used him as a normal left-back in a back four. But in a 3-5-2 where he has the extra cover behind him, it's different. He can push on, link up with Breitner (who has plenty of left-back experience himself if any cover is required) and Maradona, before rinsing Neal in any 1v1. In that role he's absolutely at home. I'll let you guys fight it out. Good luck. I'm off now as need to go into the office but that surely proves the International success of the system even more. I can't believe it has this fatal flaw when it's dominated so consistently at the world stage. On the last part, it definitely was not the 4-4-2 which kicked out the 3-5-2 (facing that set up is the system's bread and butter, as you have numerical advantages in midfield and vs the two opposition strikers). The decline of the 3-5-2 was linked to the rise of 4-3-3s and proper 4-2-3-1s with three man midfields (something like Rafa's early 00s Valencia was a trend-setter there). It's systems such as that where the focus switched from two central strikers, to inside forwards who cut inside to score goals that the formation can struggle as CBs aren't in great positions to track those inside forwards, and often there's three of them with only one player to mark. I'm still not sure on how you're dealing with Pelé. Pinching him from both sides. 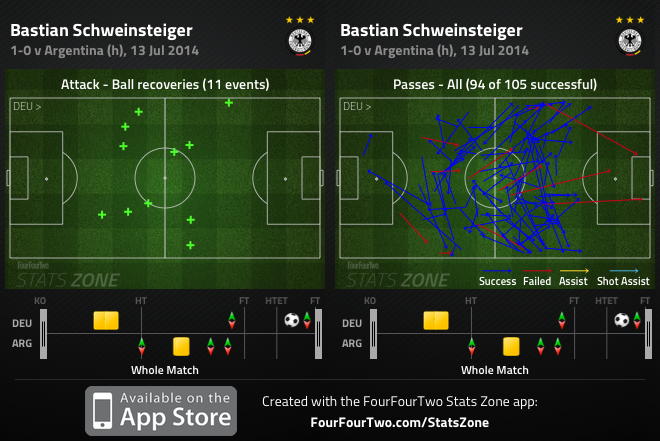 "Schweinsteiger had a tremendous game. He bossed play from his deep-lying role, completing more passes than any other player. He also made a couple of crucial interventions in his own penalty area to guard against Argentina’s early breaks – stopping the aforementioned Messi cut-back, then intercepting when Messi attempted to play the ball right to Lavezzi on the break. He also performed his defensive responsibilities well despite being on a (harsh) booking for over 90 minutes, and the fact both he and Howedes were cautioned after half an hour gave further encouragement to Messi and Lavezzi to dribble in inside-right positions. Schweinsteiger also helped to nullify Messi in his favoured number ten role. That’s not to say Messi had no influence on the game, but his best moments came either out wide on the right, or when sprinting in behind the defence. Shortly before half-time he received a ball over the top in the inside-right channel, forcing Jerome Boateng into some dramatic last-ditch defending, then at the start of the second half, he sprinted in behind for a one-on-one with Manuel Neuer from the left, pulling his shot wide. These were fine opportunities, but they weren’t Schweinsteiger’s responsibility – he forced Messi away from his favoured zone." 2. When Pele pushes through the centre of the attack, that'll be Scirea's job. He was the master at reading the game from the heart of the defence, from the middle of a back three, to quell a surging opposition. He was absolute class. His speed, his movement, how graceful he was. He used to be able to dispossess his opponents without going into fierce tackles. He did so with utter class and great timing. He was very quick and technical and when he brought it forward he became an extra midfielder. What I would have loved to steal from him was his grace and his command of the ball. He would often win the ball off opponents without them even noticing - without committing fouls, without any difficulty. He also used to score goals that I couldn't. He was always making the right run, so I tried to reproduce his qualities. He knew I played the same position as him and that I could pinch his spot. But he always made me feel at ease and I always admired him for that. He got booked at the start of the World Cup, so I said to myself 'if he gets booked again, he'll be suspended and I might get to play.' But I hoped he wouldn't because it would have been very hard to replace him and play in that team. On either side Pele has a tough assignment and, even given free reign to pick from any pool, it would be hard to think of a better suited duo to do those two jobs. Pelé was a very different player to Messi, with multiple different strengths. And Messi played for a dysfunctional Argentina side (don't forget that he plays significantly worse for Argentina, which was never a case with Pelé) — while Pelé has the abundance of creativity, goalscoring and draft around him in Law, Figo, Rensenbrink and even Suarez. Not sure if I'd pick Schweiny for this job. Both share a similar problem - the lack of service from defence (not great transition from anyone bar Moore) and midfield (given it's outmanned). How relatively little of the ball they both might see.